It's been a while since I've shared my little bargain purchases, so I figured a thrifting post was overdue! 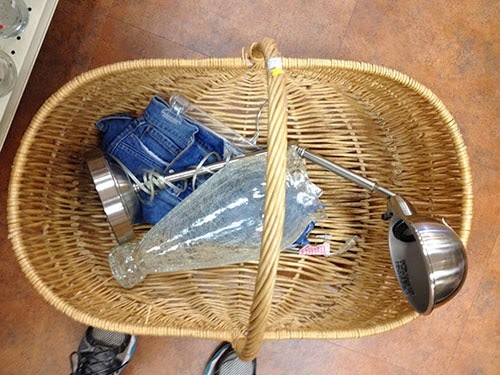 Here's a little peek into what I see when I hit my local thrift stores (and what actually comes home with me). 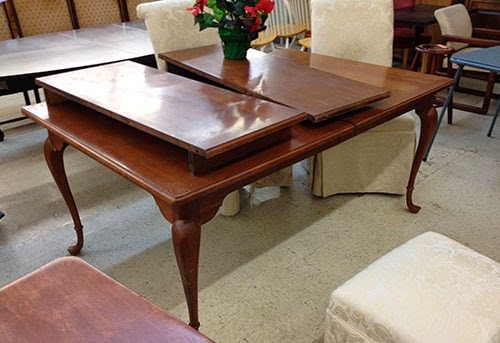 One of my friends is looking for a dining table, so I spotted these two [very different] tables on one of my shopping adventures. I love the classic, graceful lines of the first one, and I love the chunky rustic nature of the second one. Can you tell I have eclectic taste? 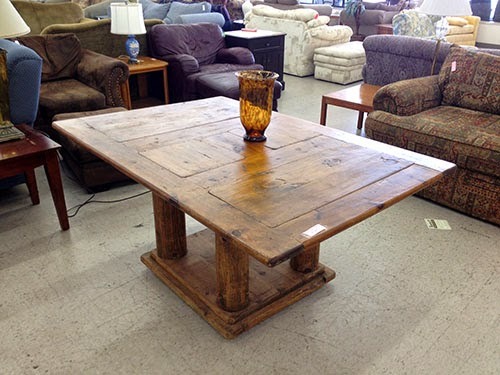 Since I'm not in the market for a dining table, I had to leave those at the store. I'm doing a lot more of that lately now that our house is full of furniture. 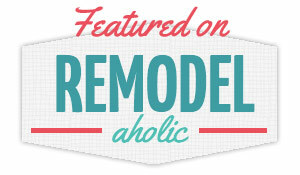 I may not have room for much furniture, but I still have room for "smalls," as they call it on American Pickers! I always scour the kitchen area of my thrift store because practically all of my serveware is secondhand. I find the coolest stuff in the dishes! 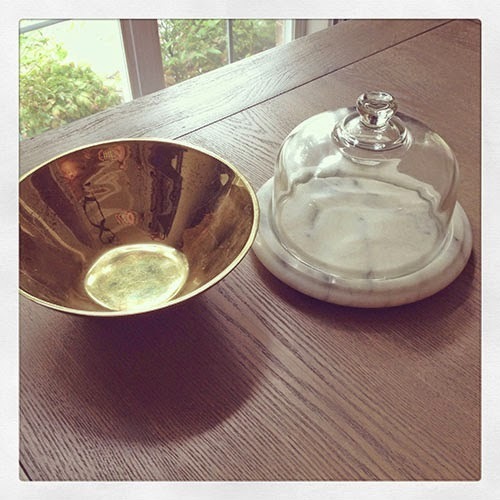 On this particular day, I came home with this adorable cararra marble cheese dome and a solid brass bowl. 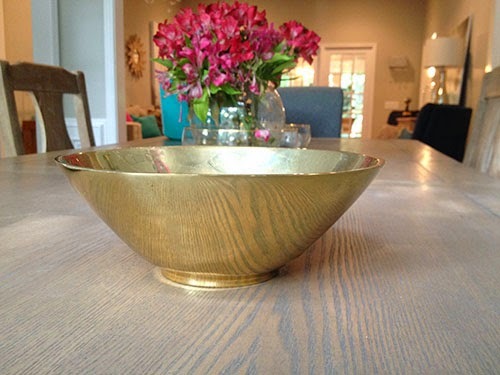 Funny story about that brass bowl– it was inside a bigger bowl on the shelf at the store, and I went to pick it up. It wasn't coming off the shelf, so I picked up the bigger bowl, thinking it was a chip and dip set and the two were glued together. Turns out this little brass bowl was so heavy that my weak little hand couldn't lift it off the shelf. I had to put some oomph into it! It's the heaviest 8" bowl ever created. I love solid brass though, so I had to have it. I paid $4 for the brass bowl and $5 for the cheese dome. Sometimes I look at the clothes, especially if I'm wanting something in particular. I've been wanting to find a Mexican fiesta-inspired summer dress, so this coral sundress caught my eye. Kind of cute, right? Pardon the unfortunate thrift store dressing room lighting. It looked to be by sme tween-y brand like Forever 21, so I figured I would get it for a couple bucks. (I couldn't read the price on the tag.) Imagine my surprised when the cashier rang it up for $50! I'm pretty sure it was a mistake, but the manager stood by that price and wouldn't budge. Sadly, it went back to the rack. The hunt for a fiesta dress continues. On the bright side, I did buy that Diane Von Furstenberg pencil skirt hanging behind me in that photo for only $5. Woohoo! Fits perfectly, no tailoring needed. Love it when that happens. 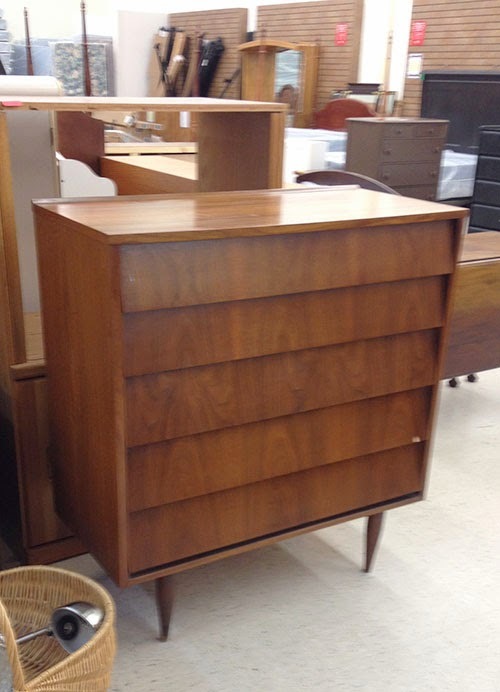 Next up, this adorable mid century chest. So sleek, right? At $50, it was a pretty good price for such an iconic style. I don't have a place for it, so I told my friend about it who really loves mid century style. Unfortunately it wasn't there when she swung by a few hours later. I'm sure it found a happy home. Would you call this nightstand a campaign style, or is it more Asian? Whatever it is, I dig it. The brass hardware is awesome. Once again I don't have a spot for it, so it had to stay. There wasn't a price tag on it, so I'm not sure what it was going for. 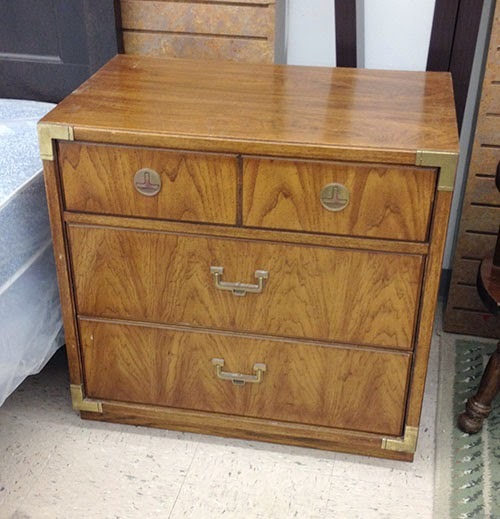 I did pull the trigger on this $40 bamboo dresser. I'm so excited to give it a glossy paint job! Can you tell it was in a little girl's room? 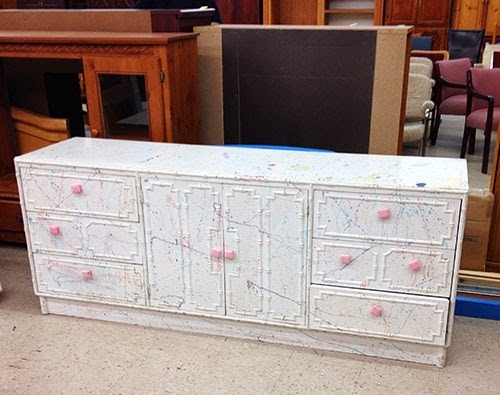 I went through a splatter paint phase when I was a kid so this brought back good memories. Still debating what color to paint it! 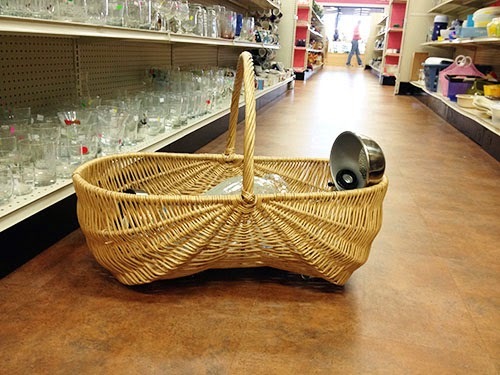 Another item I'm always looking for at the thrift store are baskets. You can find a lot of super cheesy baskets, including pastel-colored Easter baskets, but you rarely find anything big and substantial enough to put blankets in (which is what I wanted). I was instantly smitten with the curvy shape and generous size of this particular one, $5. You could totally put a baby inside of it and take the cutest newborn pictures ever. Heck, you could put a 9 month old in there! However, I'm just planning to put towels in it and store it by our back door. Why do I need towels by the back door? Because our furbabies love to dig and I'm always using towels to wipe the mud off their paws before letting them back inside. I found a couple more treasures that day and put them inside the basket. Denim shorts ($2) for a fashion DIY? Check. Adjustable task lamp for the husband's desk ($8)? Check. Shattered glass vase? Nope. Ended up putting that one back. 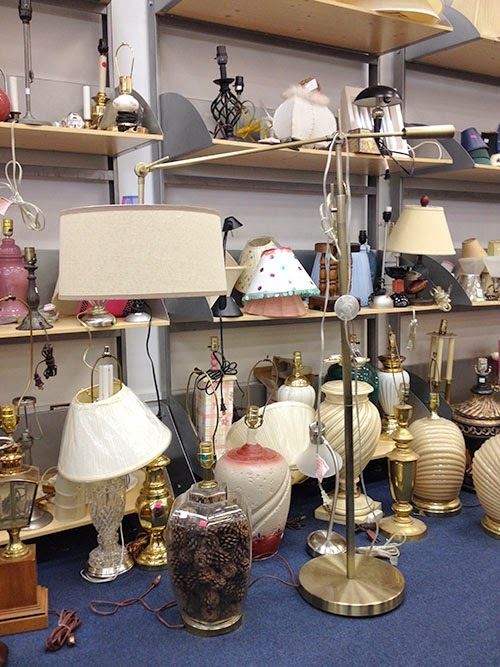 In the midst of the ugly lamp section (check out those pinecones), I spotted something pretty darn nice. Can you see it? 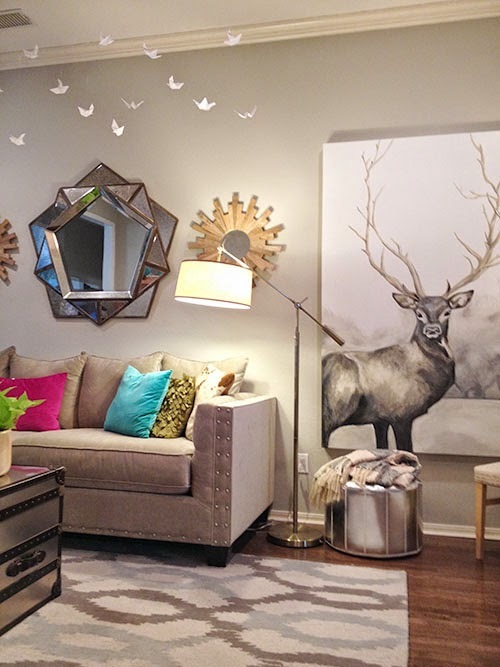 It's very similar to this $400 task floor lamp at Pottery Barn, so I feel like we got a great deal. I couldn't leave it at the store; it was too pretty! Have you found any great deals lately? Do share!